America’s Parks Through the Beauty of Art! “America’s Parks Through the Beauty of Art celebrates the original artwork of artists who have captured scenes and images depicting parks in the United States, Canada and Mexico. Subject matter may be from any park be it a national, state, provincial, county or a city park. Jurors are M. Stephen Doherty, editor of PleinAir Magazine; Susan T. Fisher, past president of the American Society of Botanical Artists & director of the Arizona-Sonora Desert Museum Art Institute; and Todd Wilkinson, managing editor ofWildlife Art Journal. The inaugural exhibition of America’s Parks Through the Beauty of Art will be held in Bolivar, Missouri at the Ella Carothers Dunnegan Gallery of Art,March 17 – April 14, 2013. Additional exhibitions are planned for 2014 and 2015. 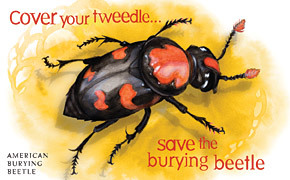 Eligible Subject Matter: Original artwork of subject matter found in any national, state, provincial, county or city park or any park of any other such unit in Canada, Mexico, and the United States. Eligible Media: Original, two-dimensional art completed in 2010, 2011 or 2012. See prospectus for more details, including ineligible media. Entry Fees: Early-entry Fee is US$30 for one entry, US$50 for two entries and US$20 for each additional entry. Standard Deadline Fee is US$40 for one entry, each additional entry US$25. Yes. 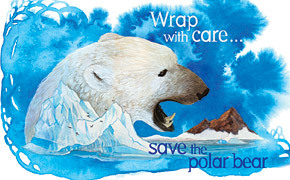 Endangered Species Condoms. Seriously. That’s creative. Lest you think this is a joke (as I did at first), you can visit the Center for Biological Diversity’s 7-Billion and Counting site and their newsletter Pop X. The world’s population is slated to hit the 7-billion mark this October. 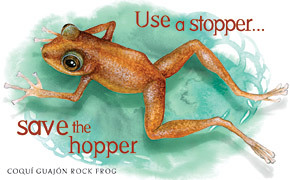 The Center for Biological Diversity‘s Endangered Species Condom initiative is their attempt at creatively (and, hey, practically) – dare I say – driving home the connection between overpopulation and environmental destruction. The CBD is relying on volunteers to distribute the condoms at public events across the US. You can even sign up to help them reach their goal of distributing 100,000 free condoms in 2011, which is a bit shy of their 2010 quota of 350,000. Maybe this map will help you decide whether or not your geographic area is in need of more free Endangered Species Condoms. Just look at that distribution! To learn more about ESPP, they have a great blog and a Facebook page that features many of the ESPP’s biocreative endeavors. 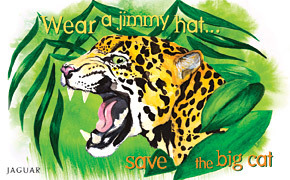 All of the prints are available for about $50, and the proceeds go directly to organizations that benefit each endangered species. 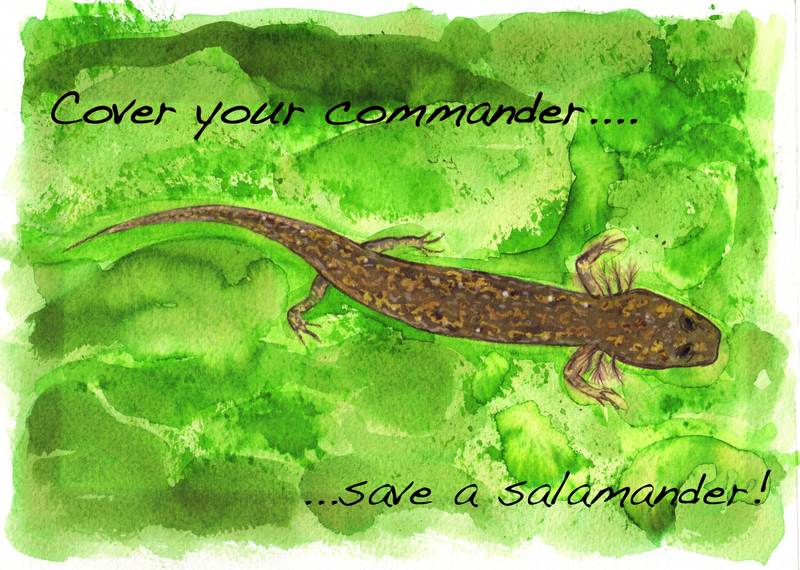 Now if only we can do a print for the critically endangered Barton Springs Salamander!? *Hint, hint Jenny & Molly! * I just happen to have a watercolor print and access to a rhyming dictionary! 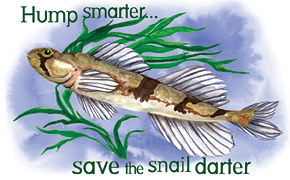 The endangered Barton Springs Salamander. Less than 200 remain in the wild. Artist: Victoria Harrell of Conroe, Texas. Just a little heads-up that I’ll be chatting about the biocreativity blog on one of my favorite radio shows They Blinded me with Science tomorrow, Monday, October 3rd from 8:30-9:00pm on 91.7FM KVRX in Austin, Texas. They Blinded Me With Science is a killer student radio show at the University of Texas that features all kinds of cool science. If you’ve never tuned in, why not start now? It’s on every Monday from 8:30-9:00pm and you can listen even if you don’t live in Austin by visiting KVRX.org! You can also follow TBMWS on Facebook and @blindbyscience on Twitter. 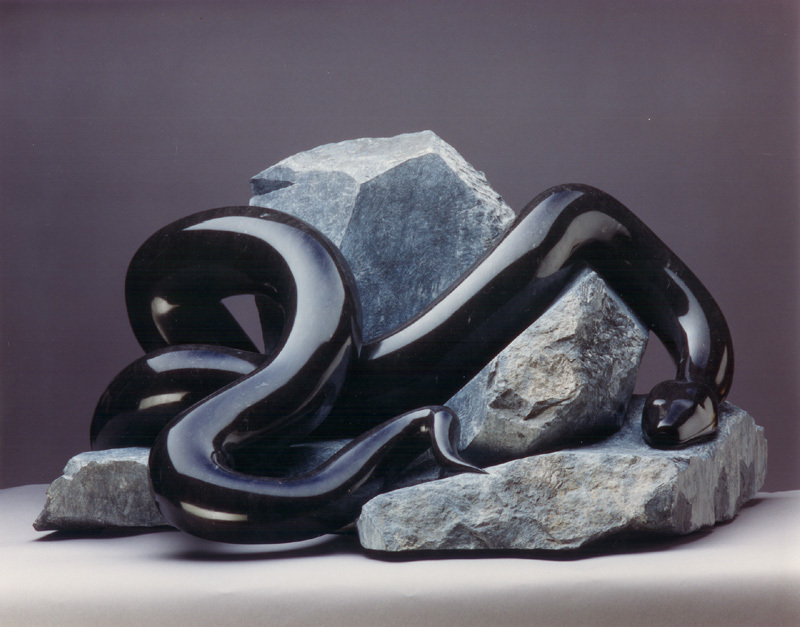 In anticipation of the Center for Snake Conservation’s First Annual Fall Snake Count (Sept 17-23, 2011), I’ve decided to compile some of my favorite artistic representations of these critters for your enjoyment. Backyard bird counts are fairly common, but this is your chance to enjoy some time outside and help conserve our native serpents! For you photographers out there, participating in the snake count also makes you eligible to enter the CSC First Annual Fall Snake Week Photo Contest! Now….on to the art! 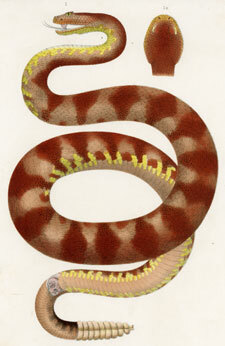 Snakes have been an object of both fascination and fear for humans for millenia. 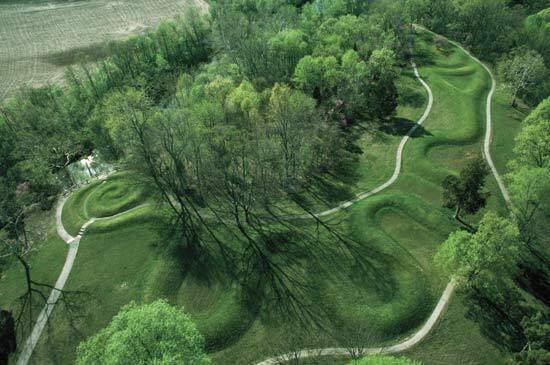 Great Serpent Mound in Ohio – the largest animal effigy in the world – depicts a snake and is though to have been built by the Fort Ancient culture of prehistoric native Americans around 1000 AD. Here is a colorful 1295–1213 B.C. 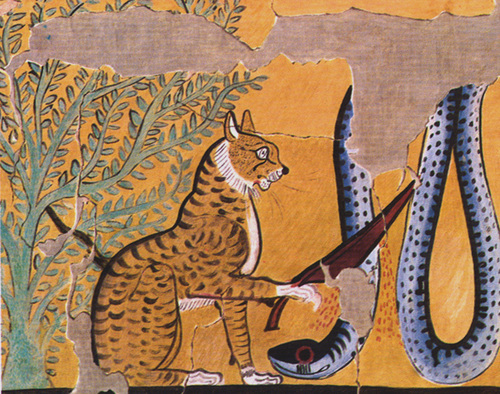 tempera on paper painting from the Egyptian Tomb of Sennedjem, depicting a very dexterous Cat Killing a Serpent. It’s amazing that this paper piece has survived the ages with these brilliant colors in tact. 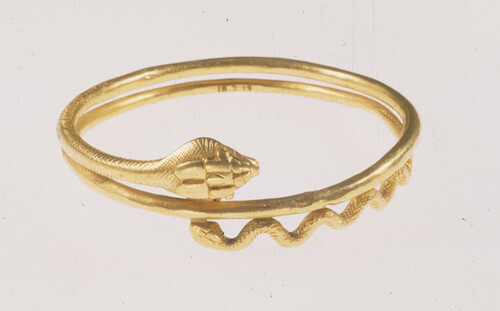 This gold bracelet, from quite a bit later in Egyptian history, depicts a coiled cobra. According to the Metropolitan Museum of Art, “after Egypt came under the rule of the Hellenistic Greeks (323–27 B.C.) and later became a province of the Roman Empire (after 27 B.C. ), the snake became a fashionable jewelry motif, well- suited for coiling around the neck and wrist.” These are still fashionable today, and you can even buy a reproduction in the Met’s store. 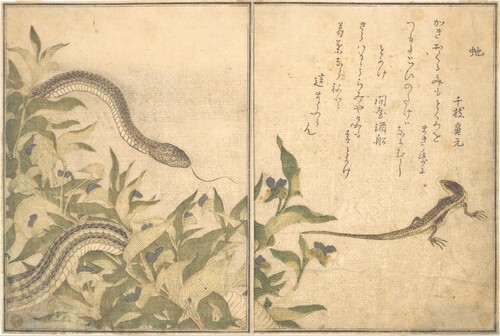 Snakes have been used as symbols of renewal and rebirth (as they shed their skin), the cyclical nature of life (depicted as a snake coiled and biting its own tail) and are invoked in a number of creation myths. 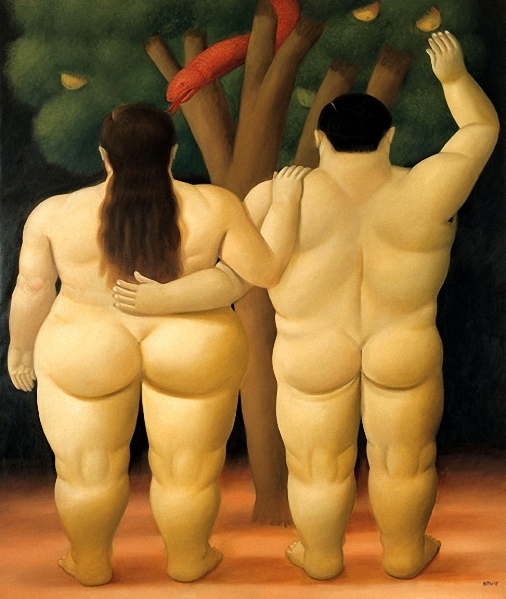 I’m sure you all recognize the pesky individual in Fernado Botero’s 1998 painting Adam and Eve. Animals, including snakes, also feature prominently in sculptures and pottery of many central American cultures. 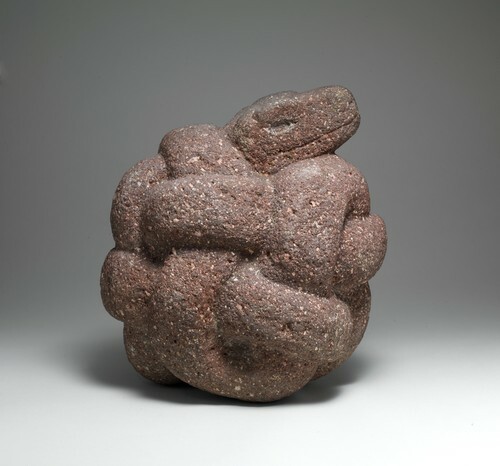 The sculpture below is an Aztec representation of a coiled snake, created in the 15th or 16th century AD. 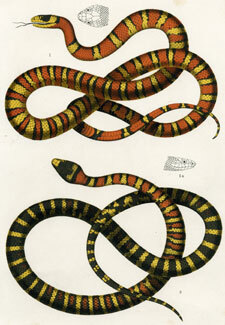 Early American explorers and naturalists rendered exquisite representations of the herpetofauna, including these prints that were included in G.M. Wheeler’s 1875 Report Upon United States Geographical Surveys West of the 100th Meridian. 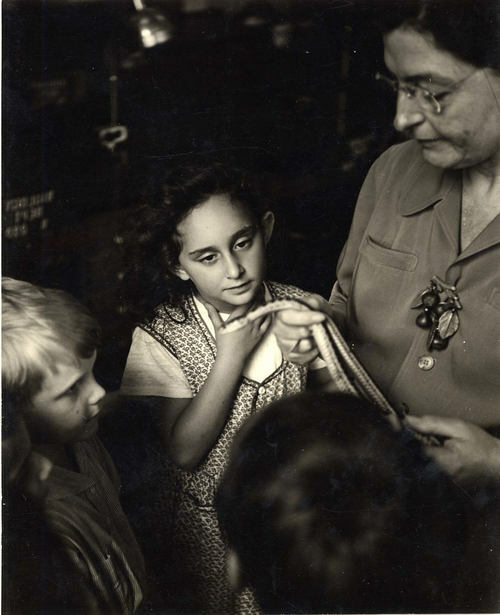 Perhaps the perfect image to celebrate the Center for Snake Conservation’s First Annual Snake Week is American photographer Lee Seivan’s 1940’s photograph Children Watching Snake Held By Teacher. This captivating photograph reveals the beguiling nature of these slithering creatures that truly makes snakes remarkable members of the animal kingdom. Whether you like them or hate them, snakes will always get your attention. If any of these images have stoked your curiosity and fascination, it’s not too late to sign up for the snake count – just visit the Center for Snake Conservation’s website. The $15 Federal Duck Stamp is a vital tool for wetland conservation, with 98 cents of every dollar generated going to purchase or lease wetland habitat for the National Wildlife Refuge System. Since the stamp’s inception, sales have helped to acquire nearly six million acres of wildlife habitat at hundreds of refuges in nearly every state. 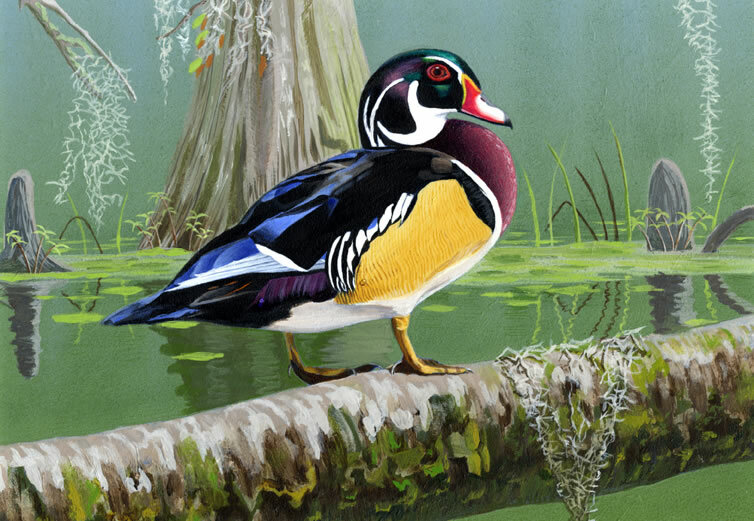 There’s even a Junior duck stamp contest – and the entries are amazing! This program seems to exhibit the very essence of biocreativity and is wonderful science-art project. 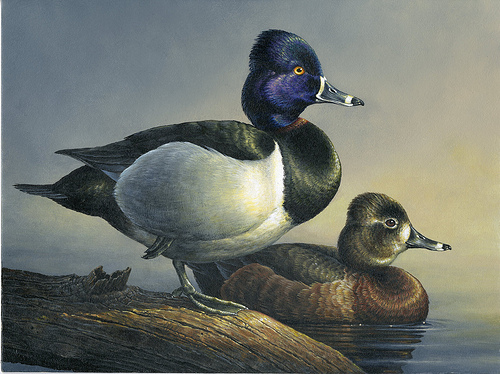 The Junior Duck Stamp Conservation and Design Program is a dynamic, art and science program designed to teach wetlands habitat and waterfowl conservation to students in kindergarten through high school and help reconnect youth with the outdoors. 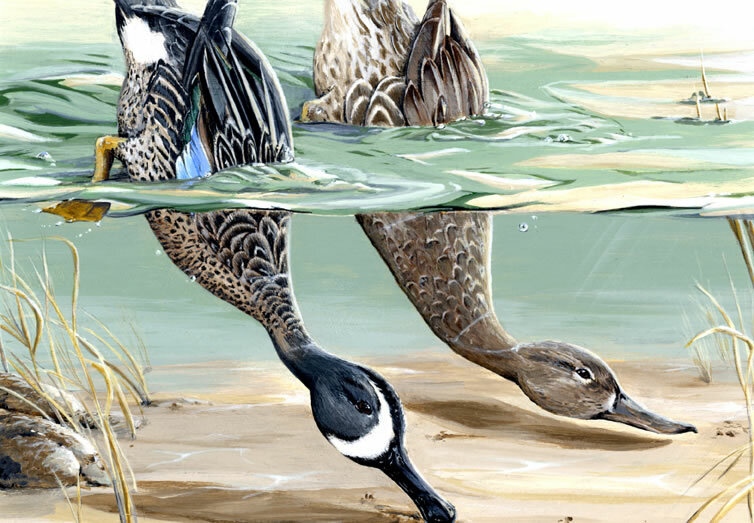 The program guides students, using scientific and wildlife observation principles, to communicate visually what they have learned through an entry into the Junior Duck Stamp art contest. This non-traditional pairing of subjects brings new interest to both the sciences and the arts. It crosses cultural, ethnic, social, and geographic boundaries to teach greater awareness of our nation’s natural resources. This year’s winner was 17-year-old Abraham Hunter from Vienna, Illinois. Check out the finalists from each state here. 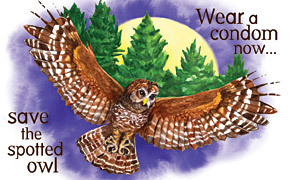 Winner of the Federal Junior Duck Stamp Art Contest 2011 by 17-year-old Abraham Hunter of Vienna, Illinois. This blog is a lot of fun, but it takes a lot of hours to research and write each week. If you enjoy what you read here, please consider making a donation. Biocreativity is a member of the Science Artists FriendFeed curated by Glendon Mellow! Each month, I create a new biocreativity title image and making of video for the blog. Click on the vimeo link above to visit the archive.